This week, we welcomed Dr. Jonathan Plucker to #gtchat to discuss the Excellence Gap and what could be done to impede its growth. Although the focus of the chat was on the U.S., it was noted that recent data shows that this phenomenon is unfortunately occurring in other countries as well. The Excellence Gap refers to differences in advanced achievement between groups of students; usually focusing on gaps in underperforming groups based on race, ethnicity and socio-economic status. Individuals in all demographic groups have the potential to achieve at advanced levels, but identification is key. Competency must be addressed at every level of achievement; not just the minimum level. According to Dr. Plucker, “Many different factors have caused the existence and persistence of large excellence gaps including poverty, discrimination, poor access to quality education, psycho-social barriers, among others.” Excellence gaps can occur due to inadequate funding and resources in schools serving low income and disadvantaged minority communities; inadequate training for teachers working with underperforming subgroups of students; and because of attitudes about high achievement potential of low-income and minority students. We then turned out attention to what effect the new Every Student Succeeds Act (ESSA) might have on closing the Excellence Gap. “We’re not sure yet, as the regulations have yet to be developed; but it COULD mean more adaptive testing and better data reporting. ESSA throws it back to the states, but we need to keep the pressure on at the state level. It cracks the door, but we have to open it,” said Dr. Plucker. A transcript a may be found at Storify. Global #gtchat Powered by the Texas Association for the Gifted and Talented is a weekly chat on Twitter. Join us Tuesdays at 8E/7C/6M/5P in the U.S. and Wednesdays at 2 PM (13.00) NZDT/Noon (11.00) AEDT/Midnight UK (Subject to change due to Daylight Savings Time). to discuss current topics in the gifted community and meet experts in the field. Transcripts of our weekly chats can be found atStorify. Our Facebook Page provides information on the chat and news & information regarding the gifted community. Also, checkout our Pinterest Page and Playlist on YouTube. UK: Why Isn’t Pupil Premium Closing Excellence Gaps? The gifted identification process has been a hot topic in gifted education for decades. Far too often it is mired in personal prejudices, politics, and misapplied theories about what constitutes a gifted student. Dr. Joy Lawson Davis, our guest expert, shed some much needed light on the topic during our chat and we thank her for taking the time to share her insights with us. There are several issues associated with the fair assessment. The fairness of group vs individual testing is an important factor when considering assessing gifted students. There needs to be a procedure in place for identifying students in immediate need of services as well as potential for need. The identification process must involve the collaboration of multiple stakeholders – administrators, teachers, parents and the student. Dr. Gail Post, clinical psychologist, pointed out that “when schools form a gifted “program” with loose guidelines”; it can become an issue. The responsibilities of program administrators in the identification process are first being responsible for eliminating bias in the choice of assessments to be used to identify gifted students. Carolyn K of Hoagies’ Gifted suggested, “Program administrators should do in-service to refresh teacher training on specific measures, and keep an eye out for unusual gifted kids.” Finally, administrators should periodically review the identification process. A transcript of this chat may be found at Storify. Enjoy our blog, but haven’t joined in a chat on Twitter? We’d love to have you share your expertise with others. Who knows? You may be quoted in one of our posts and you will definitely be included in the transcript. Not sure where to start? Check out our post here to find out how! And remember that #gtchat now meets on Tuesdays at 8E/7C/6M/5P. See you there! Recently, the U.S. Congress reauthorized the Elementary and Secondary Education Act of 1965 (ESEA). Replacing the controversial No Child Left Behind Act, the new legislation is commonly referred to as the Every Student Succeeds Act (ESSA). A $21 billion appropriation of federal funds to states and school districts, it proclaims to reduce the overuse of standardized testing and one-size-fits-all mandates. Many participants at this week’s chat expressed doubts that the new legislation will make any difference at all for most gifted students and were leery of comments coming from the NAGC. However, the importance of having gifted students even acknowledged in the ESSA was considered a victory by most. The ESSA also specifically mentions types of services; such as acceleration, enrichment, and dual enrollment. Only time and a commitment to advocacy will tell if it will be effective. Much of the law is about ‘allowing’, but there are several important ‘requirements’ that pertain to gifted students. For Title I, the funds are allowed to be used to identify and serve gifted students. When reporting student achievement data on low-SES, race, ELL, gender and students with disabilities; states must now include data on students who achieve at the advanced level. All identified gifted students may participate in programs funded by Title 1; regardless of socio-economic status. Gifted Education will continue to be at the discretion of the local school district. Although it is important legislation, advocates are being tasked with ‘getting the word out’; the ESSA is over 300 pages. In the end, it will be incumbent upon advocates for gifted education to educate local districts on provisions for gifted students in the ESSA. A transcript of this week’s chat may be found at Storify. This week also marked the 6th birthday of #gtchat on Twitter! Thank you to all who have and continue to support us! 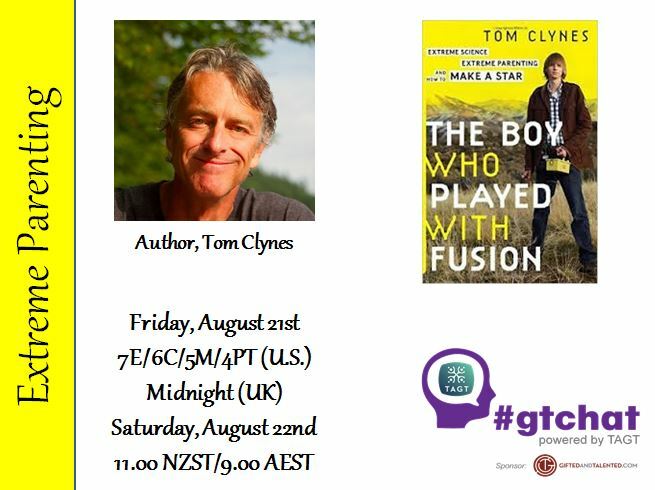 This week our guest was Tom Clynes, author of The Boy Who Played with Fusion: Extreme Science, Extreme Parenting & How to Make a Star. If you work with gifted children, advocate for gifted education or are the parent of a gifted child, you will love this book. 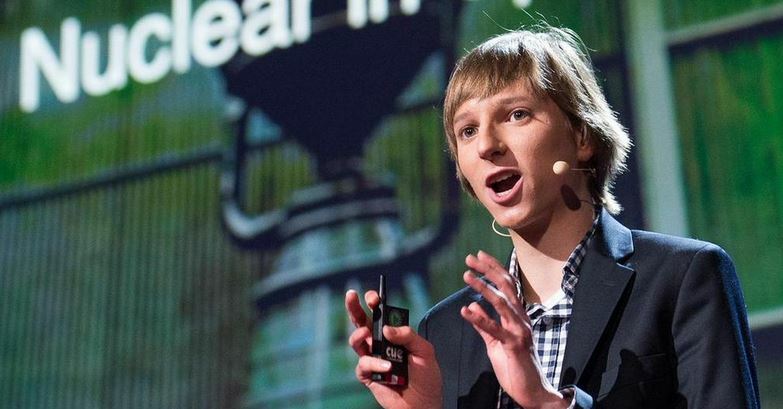 It is the fascinating story of Taylor Wilson, a science prodigy, who became the youngest person in the world to achieve nuclear fusion at the age of 14. Our topic this week was ‘Extreme Parenting’ which by any measure would describe the Wilsons’ parenting style. Their counter intuitive approach to parenting flew in the face of conventional wisdom, but proved to be exactly what Taylor needed to reach for the stars and eventually create one for himself. Beyond a great read, author Tom Clynes makes a convincing argument for the need to provide an appropriate education for gifted children who are languishing in classrooms across the U.S. It is refreshing to hear from someone outside the gifted community establishment come to this conclusion after extensive research into the history of gifted education and seeing first-hand the role education plays in identifying and supporting our nation’s best and brightest. Photo courtesy of Lisa Conrad. The discussion then switched to the future and what needs to change in how we educate gifted children. Tom had lots of advice on what to do next, “We’ll need to shift the course of an educational culture that has been surprisingly slow to accept its own research. Many educators still cling to the unsupported belief that acceleration hurts children emotionally and socially though hundreds of studies show that most children are happier among intellectual peers. Acceleration has positive, long-term affects on careers, productivity and life satisfaction. Another persistent myth is that it’s expensive to help gifted children develop their talents. Some interventions (such as ability grouping and acceleration by subject) require few resources. These kids don’t need expensive new programs, they just need what older kids are already getting. We also need more teacher training to identify gifted students, and policies to ease early college admission for qualified kids. And educators need to cast a wider net to identify gifted rural and minority students who are often overlooked in talent searches.” You can read more about acceleration here. 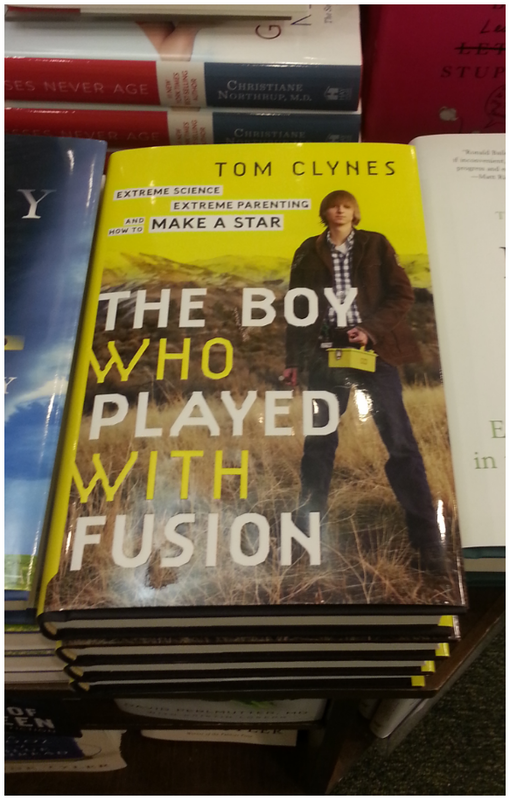 In ‘The Boy Who Played with Fusion’, we see Taylor Wilson’s parents use what Tom Clynes refers to as an ‘extreme parenting’ style which challenges traditional parenting. Tom explains, “By the time Taylor was 11 years old he was collecting and experimenting with radioactive materials, some supremely scary stuff. 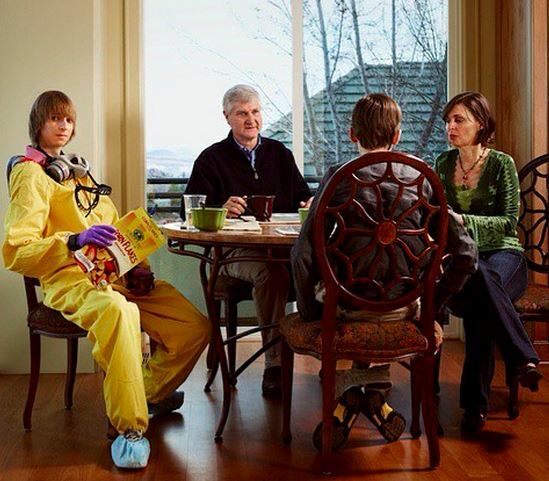 Instead of doing what most parents would regard as common sense – keeping their kid away from things that could kill him … Tiffany and Kenneth took a counter-intuitive approach to nurturing Taylor’s talents. The lengths to which they were willing to go to support Taylor as he pursued his unnerving interests were, to me, even more impressive than Taylor’s intrinsic talents. At 14, he became the youngest person to build a working nuclear fusion reactor, a miniature sun on Earth. His parents brought in educators and mentors to guide Taylor…so he could pursue his interests safely.” You can read more on that here. A final thought offered by Lisa Lauffer of Create Miracles was, “We parents get to enjoy guiding these unique kids along their paths. Let’s enjoy the journey!” A transcript of this chat may be found at Storify. Global #gtchat Powered by the Texas Association for the Gifted and Talented and sponsored by GiftedandTalented.com is a weekly chat on Twitter. Join us Fridays at 7E/6C/5M/4P in the U.S., Midnight in the UK and Saturdays 11 AM NZST/9 AM AEST to discuss current topics in the gifted community and meet experts in the field. Transcripts of our weekly chats can be found at Storify. Our Facebook Page provides information on the chat and news & information regarding the gifted community. Also, checkout our Pinterest Page and Playlist on YouTube. Would You Let Your Kids Play With Fusion? Is the U.S. Overlooking Its Most Gifted Students?